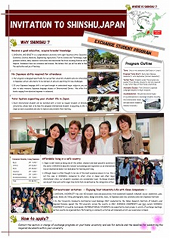 Exchange student program is offered to our partner Universities based upon academic exchange agreement between Universities by Shinshu University Center for Global Education and Collaboration. Students who are enrolled in one of our partner universities and are able to stay at Shinshu University for 6 - 12 months as special auditing students. From Intensive Japanese Language subjects by Shinshu University Center for Global Education and Collaboration (GEC) to major subjects offered by Faculties or Divisions. To complete the program, students must take at least 10 credits a year (One-semester students: 5 credits). Please download the designated form (differs by the semester) through the latest application guidelines posted on our web news. I am very glad that I went on my exchange at Shinshu University. Everything was well arranged, and the staff at the International Center and the teachers were always ready to assist with any problem the foreign students might have. I was also surprised at the number of activities organized each month for the foreign students. Thanks to these activities, I not only gained many new experiences, I also met a lot of interesting people! The Shinshu campus in Matsumoto has a very pleasant atmosphere. I'm not much for very big cities like Tokyo, so I very much enjoyed the smaller scale of the campus, and the city around it. I liked how everything on Matsumoto campus is close by, like Coop and the library. The library is big enough and has good heating/air conditioning. The collection is a bit old (especially the non-Japanese language part), but serviceable. The first semester I was in intermediate level, which gave me a solid review of the things I had already studied - but better. Compared to home there were a lot of class hours, and sometimes a little repetitive, but you can learn very much in there. The second semester I was in upper-intermediate level, and the class structure was different; we got to choose more ourselves. This semester I especially found it interesting that we were allowed to choose classes in the regular faculties, with Japanese students. It was great to experience the methods of Japanese professors towards Japanese students, and the way of examination. At first, I had to get used to life in Japan, because it's so different from home. But with help from friends and time I began to like it, especially in Matsumoto. Nature is close by wherever you look (also on campus), and the air you breathe is clean. All four seasons are beautiful here, and I'm definitely coming back sometime. I made lots of friends, both foreigners and Japanese people, and got to join a Taiko group (Kaendaiko) which I've always wanted. Of course there were irritations, but in the end, I didn't want to go home. Life wasn't as much as different to my country as I thought. I felt comfortable from the beginning. Of course my Japanese has improved a great deal. I even took a course in economics in my second semester, which I never thought I would be able to do. But other than that, I have also made many great friends. The most important thing that I learned from my stay at Shinshu University, is that no matter where they live or what language they speak, people are the same on the inside everywhere. I used to believe different cultures produce different people. Now I know that that those differences are not so great as the similarities all people share. I learned a lot about Asia, the Japanese culture, language and people. Go. Do everything in your power to go, especially if your field of study is Japanese, because you will get a valuable experience that you can't get anywhere else. Speak as much Japanese as you can (even with friends from the same country! ), otherwise you'll never become fluent. Think as little as possible about home; make new friends here, build a new home for this year. If you want to join a club, do it. It's the easiest way of making Japanese friends. They're shy at first, but that doesn't mean they don't like you. Travel as much as you can, because every region in Japan is completely different. And lastly: Have fun! Give it your all, because you'll never get a chance like this again. Try to meet as many as Japanese students as you can. participate in the University life and don't just hang around with the other exchange students. © SHINSHU UNIVERSITY. All RIGHT RESERVED.